Reading moved a step closer to winning the FA WSL 2 title with a 2-0 win at third-placed Everton and captain Kirsty McGee admits she is now desperate to finish the job next week. 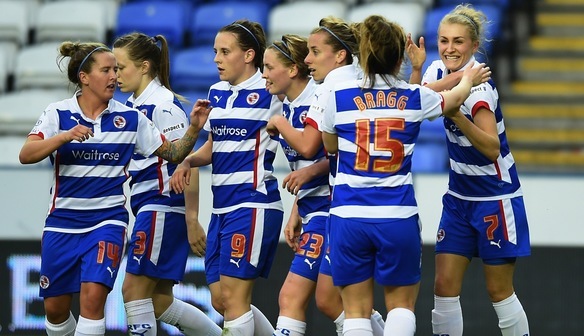 A superb strike from Rachel Rowe gave Reading an early lead before Helen Ward sealed it late on to send the Royals to the top of the table – ahead of Doncaster Rovers Belles on goal difference. Currently seven goals better off than Doncaster, a victory away to Aston Villa next Sunday would most likely secure the title for Reading and McGee is confident after the hard-fought win over the Toffees. “We're pleased to be back on top and hopefully next week we can go out and do the job and become champions. It was hard work but we've done it,” she said. “We knew the quality Everton had and they have a fantastic team and to be fair they'll probably think they deserve to finish higher than third place. “Our aim this season was to get promoted but now we have been promoted we want to be champions. Rowe gave Reading a 15th-minute lead at the Select Security Stadium when she finished a lovely flowing move by taking advantage of Laura-May Walkley’s skilful lay-off to blast in an angled drive from the edge of the area. Lois Roche nearly doubled the lead on the half hour but saw her speculative long-range shot tipped away by Kirstie Levell with McGee narrowly heading the resultant corner wide. But Ward sealed the victory in the 90th minute when she lobbed the onrushing Levell with Gabby George unable to stop the ball crossing the line. And Everton skipper Michelle Hinnigan believes the result doesn’t reflect the effort her side put in. “We're all very disappointed with the result and we don't think it was a 2-0 game,” she said. “We kept the ball really well and probably had the most possession but we didn't really commit ourselves in the final third of the pitch or create any clear chances. “We need to be more clinical and put our chances away. “The experience we have in the team means we're old enough to take this game on the chin, put it to bed and concentrate on finishing as high up the table as we can.